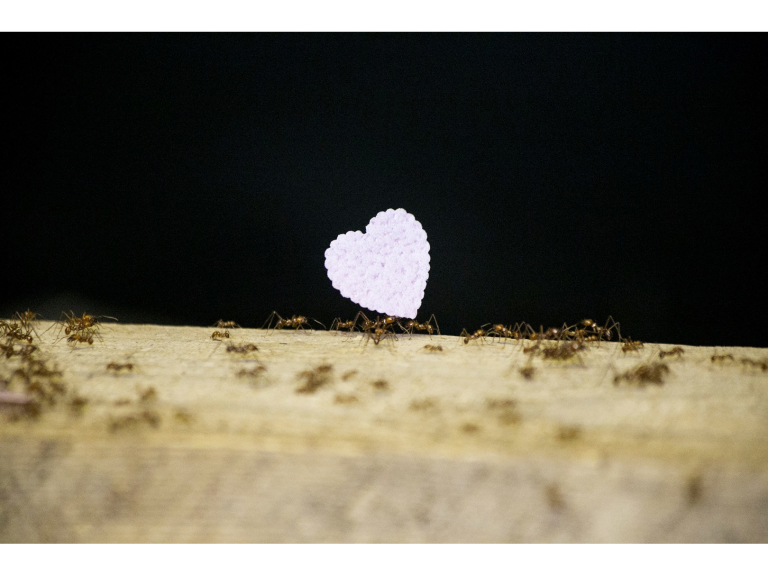 As Valentine’s Day looms, ants at Paignton Zoo Environmental Park in Devon are busy showing humans the way when it comes to grand romantic gestures. These industrious insects have been carrying enormous hearts back to their nests. Leafcutter ants can carry more than 5,000 times their body weight. That’s like a human being carrying 375 tonnes – or 93 elephants the size of Paignton Zoo’s popular female African elephant, Duchess. In truth, leafcutter ants are amazing, but not especially romantic. Females mate on the wing with numerous males, collecting enough sperm to found a new colony. Queens can live for up to 15 years. After humans, leafcutter ants form the largest and most complex social systems on Earth. Their huge nests can contain five million ants and their social structure features different castes, including workers, foragers and soldiers. They use a system of agriculture to grow fungus which they feed to their larvae. There’s even a special class of workers to manage the colony's rubbish dump. Paignton Zoo is home to two colonies of Atta cephalotes. One colony – with about 1800 individual ants - can be seen in the Zoo’s Investigate exhibit. In the wild, this species is found from Mexico to Bolivia. It lives in nests up to 7 metres deep that have been positioned so that air currents remove the otherwise dangerous CO2 given off by the fungus they farm and eat. Paignton Zoo Environmental Park is a registered charity. For more information go to www.paigntonzoo.org.uk or ring 01803 697500.